This simple chicken and rice dish takes just minutes to prepare, and it's cooked hands-free in the slow cooker. Condensed soups help make this dish an easy and convenient fuss-free meal. This is a good choice for a busy day. It will keep you out of the kitchen! To add color to the plates, serve the chicken and rice with cooked glazed carrots, simple steamed fresh or frozen broccoli, or fresh sliced tomatoes, or serve it with a tossed salad. A garnish of parsley or sliced green onion tops can add color as well. Add biscuits or crusty rolls for a satisfying family dinner. Spray the bottom and sides of the crockery insert of the slow cooker with nonstick cooking spray to minimize sticking. Or, use a plastic crockpot cooking bag (liner). In a slow cooker, combine the 2 cans of soup and the converted rice. Place the chicken on top of the mixture and then season with kosher salt and freshly ground black pepper. Top with the diced celery and chopped green onions. Cook for 2 1/2 to 3 hours on high or about 5 to 6 hours on low, or until the chicken is done and the rice is tender. Rice can get mushy and chicken can be dry if cooked too long. We recommend you begin checking for doneness at 21/2 hours on HIGH or at about 5 hours on LOW. Mine was done at around 2 1/2 hours on HIGH. To check for doneness, use an instant-read food thermometer inserted into the thickest part of the chicken breast halves. The minimum safe temperature for cooked chicken is 165 F (74 C). See the meat temperature chart and safe cooking tips for information. The average chicken breast weighs in at around 8 ounces these days, and the American Heart Association considers 3 ounces (3.5 ounces for fish) a "portion." If the chicken breasts are large, you might want to use only two halves. Slice them horizontally into cutlets to make 4 smaller cutlets. For 6 servings, increase the chicken to 6 small chicken breasts or cutlets. Add 1 more can of soup and use 1 1/2 cups of rice. Increase the celery and green onions as desired. Sauté about 8 ounces of mushrooms in a few tablespoons of butter and scatter them over the chicken. 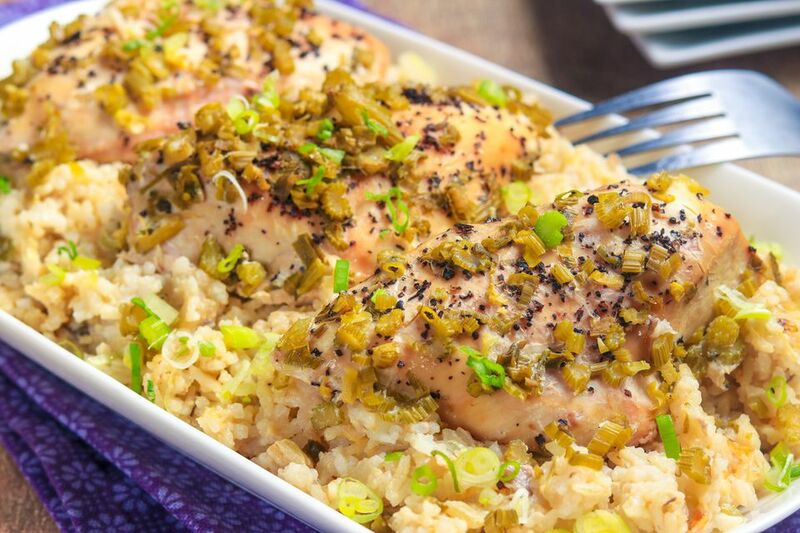 Instead of scallions, sprinkle about 1/4 cup of minced onion over the chicken breasts.